Is your season-long fantasy league over? Then why not play daily fantasy? We'll help you out with a Week 17 lineup. Is your season-long fantasy league over? Then why not play [daily fantasy](https://www.betchicago.com/dfs-week-17-value-plays-sam-darnold)? We'll help you out with a Week 17 lineup. I didn't fill out a lineup last week, so my last go-around [was Week 15](https://www.betchicago.com/nfl-week-15-draftkings-lineup), when I failed to tally more than 110 points for the first time. I had just 97.42, thanks in part to Ryan Tannehill's 4.42 in Minnesota. Anyhoot, let's get back on track this week. Here are my results so far this season: Week 2, 160; Week 3, 166.2; Week 4, 130.5; Week 5, 133.5; Week 6, 143.6; Week 7, 114 (yuck); Week 8, 147.5; Week 9, 114.64; Week 10, 139.4; Week 15, 97.42. Let's see if I can get some of that early season magic back. __MORE:__ [Bears stat correction alters fantasy championships](https://www.betchicago.com/bears-cohen-fantasy-championship) | [Week 17 waiver wire wish list](https://www.betchicago.com/waiver-wire-add-list-week-17-fantasy-football) | [Fantasy All-Stars](https://www.betchicago.com/fantasy-football-gold-stars-season-awards) __ALSO:__ [Week 17 win total update](https://www.betchicago.com/nfl-win-total-update-week-17-sunday-night-colts-titans-over-bettors) | [Week 17 staff picks ATS](https://www.betchicago.com/nfl-picks-against-spread-week-17) | [Week 17 power rankings](https://www.betchicago.com/nfl-week-17-power-rankings-bears) __PLAY:__ Our free [Bears Playoff Ticket Giveaway Game](https://betchicago.chalkline.com/games/nfl-chicago-contest)! Just answer six prop questions correctly for Sunday's Bears-Vikings game for your chance to win two tickets to a Bears home playoff game. ## NFL Week 17 DraftKings lineup *[DraftKings](https://www.draftkings.com/lineup) gives you a budget of $50,000 __QB: Aaron Rodgers, Packers ($6,300), vs. Lions__ -- I usually don't go this expensive with my quarterback, but I'm going with the future Hall of Famer based on sheer volume. Rodgers is averaging nearly 45 pass attempts in his last four games, and you know he's not going to throw an interception (he has only two in 592 throws this season). Detroit is also allowing a league-high 8.2 yards per pass attempt. 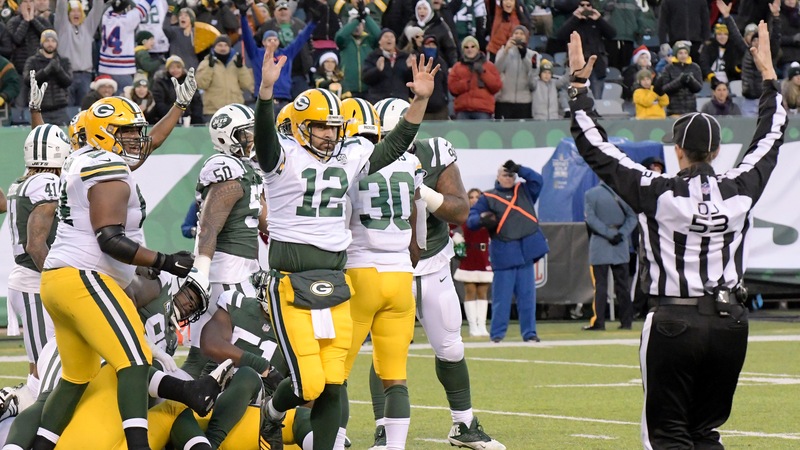 Green Bay also showed surprising fight last week despite being out of playoff contention, coming back from [a 15-point, fourth-quarter deficit to beat the Jets](http://www.espn.com/nfl/game?gameId=401030870). <a href="https://www.youtube.com/watch?v=8atSq6jgonQ" class="embedly-card" data-card-width="100%" data-card-controls="0">Embedded content: https://www.youtube.com/watch?v=8atSq6jgonQ</a> __RB1: Saquon Barkley, Giants ($8,200), vs. Cowboys__ -- You avid readers know this spot is generally [reserved for Todd Gurley](https://www.betchicago.com/nfl-week-15-draftkings-lineup). But this week it'll go to his heir apparent. Don't love that the New York rookie is only averaging 2 yards per carry the last two weeks, but against [an unmotivated Cowboys team](https://www.betchicago.com/nfl-week-17-early-game-rundown-texans-patriots), sign me up. Plus, he's still Eli Manning's favorite check-down receiver (17 targets the last two weeks), so his floor is still high. __RB2: Jaylen Samuels, Steelers ($6,800), vs. Bengals__ -- Pittsburgh, [with its back against the wall](https://www.betchicago.com/nfl-week-17-late-game-rundown-vikings-ravens-playoff-scenario), will lean on its run game against a Cincinnati defense that allows the fourth most rushing yards per game (142.6). The Steelers rookie is averaging 6.3 yards per carry the last two games and has 15 catches in the last four. __WR1: Julian Edelman, Patriots ($7,600), vs. Jets__ -- Who else is Tom Brady going to throw to? With no Josh Gordon and a banged-up Rob Gronkowski, Edelman has seen an uptick in his looks, with double-digit targets the last three weeks. The Jets have allowed two touchdown passes and no interceptions each of the last two weeks to Rodgers and Deshaun Watson. Brady, you're next ... and, as a result, so are you, Julian. __WR2: Larry Fitzgerald, Cardinals ($4,900), at Seahawks__ -- In what could be the last game of his Hall of Fame career, don't you think Arizona will do everything it can to get him into the end zone one last time? Fitz has scored six times this season, and even if he doesn't get a touchdown, he still has 18 catches the last three games, so his touches are still pretty high. They even let him throw one in last week's loss to the Rams. <a href="https://www.youtube.com/watch?v=143wuY7CIR8" class="embedly-card" data-card-width="100%" data-card-controls="0">Embedded content: https://www.youtube.com/watch?v=143wuY7CIR8</a> __WR3: Jordy Nelson, Raiders ($4,900), at Chiefs__ -- He's been sneaky good since coming back from injury, with 29 catches for 308 yards the last four games. Now, if he could just find the end zone for the first time since Week 5, we'd be in business. He'll face a Chiefs defense that's allowed 30 passing touchdowns, sixth most in the league. __TE: Chris Herndon, Jets ($3,400), at Patriots__ -- Putting another New York rookie in this week's lineup, and he's been on fire lately, with nine catches for 135 yards and a touchdown the last two games. There are 15 tight ends more expensive than him this week, and I'll guarantee he finishes at least in the top-10 at the position. __FLEX: Vance McDonald, Steelers ($4,200), vs. Bengals__ -- Hate to go with a tight end in the flex, but I ran out of money, so here we are. He has at least 5.5 fantasy points in all but one game this season, so at least you know what you're getting. Also, the Bengals have allowed 31 touchdown passes this season (tied for second most in the league), so there's at least a possibility he gets into the end zone. __D/ST: Seahawks ($3,700), vs. Cardinals__ -- On the surface, Seattle might lack motivation in this game. But the difference between the No. 5 and 6 seed in the NFC could be the difference between a trip to Chicago or Dallas in the first round, so expect a spirited effort at home from the Seahawks, whose defense has averaged nine fantasy points in their last three home games. For more good value plays for daily fantasy in Week 17, click [here](https://www.betchicago.com/dfs-week-17-value-plays-sam-darnold).